This coil is compatible with Nautilus BDC as well Mini Nautilus tank. Not compatible with Regular Aspire BDC !!! These are the Genuine Aspire Nautilus Replacement Bottom Vertical Coil (BVC) for your favorite Aspire Nautilus MINI (BVC) (stands for "Bottom Vertical Coil"). Aspire Nautilus Replacement Bottom Vertical Coil (BVC) Head have all the great qualities of the standard Aspire BDC Coils but is designed specifically to work with the Aspire Nautilus MINI (BVC) atomizer. Like the standard Aspire BDC Coils, Aspire Nautilus Replacement Bottom Vertical Coil (BVC) feature dual heating elements to provide twice the vapor but WICK LESS coil which greatly improves and simplifies the vaping experience. 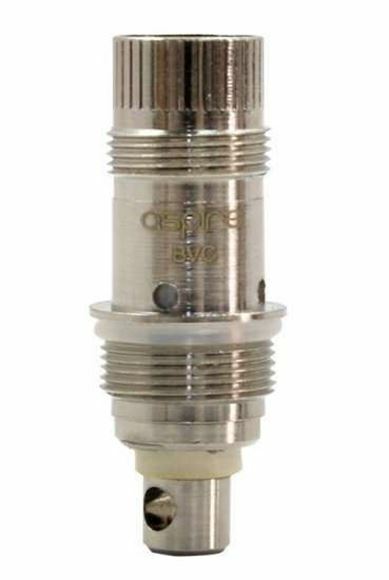 These are the genuine Aspire Nautilus Replacement Bottom Vertical Coil (BVC) Head at an unbeatable price. Unscrew the metal bottom cap from the Aspire Nautilus MINI (BVC) tank. Resistance - no resistance design. Aspire Nautilus Replacement Bottom Vertical Coil (BVC) Head have free shipping, it will not add any extra shipping charge.